As fall and winter bring cooler temperatures to Tulsa, we’ll soon be ready to start using our fireplaces again. 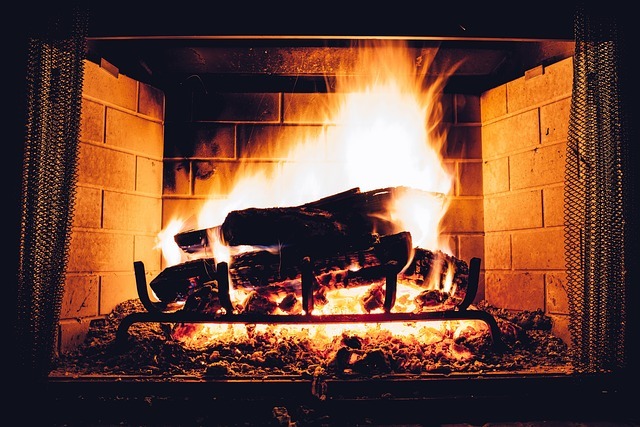 If you have hardwood floors in the room with your fireplace, there’s always the chance of a stray ember or spark flying loose and damaging the floor. When we install wood floors in a new construction around a fireplace, our standard practice is to cut out and/or trim to make room for the hearth. But fireplaces can still be a little unpredictable, especially wood-burning ones. What steps can you take to protect your wood floors and give yourself greater peace of mind? One of the most consistent ways to protect your floors is never to operate the fireplace without a screen or cover. Sparks may sometimes escape the grate if the wood crackles or pops, but nearly all of the dangerous hot material can be contained just by keeping that screen or covering in place. If you have a small hearth in front of the fireplace, or a hearth that is not elevated, you run the risk of heat damage to the floors. Consider installing a hearth extension made of a non-combustible material like brick, stone or slate. It’s a few hundred dollars well spent to buy peace of mind. For a solution that is less invasive but just as effective, purchase a hearth pad or fireplace rug to lay in front of the hearth. Pads made of tile or other hard materials can often act like a hearth extension, but even a decorative fire-retardant rug can add some protection. One word of caution: Don’t use a plain ordinary rug thinking it will protect your floors. If the rug itself can be ignited by an ember, you may have a much more dangerous problem on your hands. Always use something that is flame resistant. Even with additional safeguards in place, it’s possible to build a blaze that is simply too intense. The same goes for wood-burning stoves. Overly hot fires are difficult to restrain, and the heat can cause damage to your floors, your hearth and the fireplace itself. Avoid burning paper products, plants or other combustible substances which can burn hotter or cause sputtering. Never start a fire with lighter fluid or similar highly combustible fuels. And of course, never treat a gas fireplace like a wood-burning fireplace as it may not be built to withstand the heat. All told, basic common sense is perhaps your best measuring rod in protecting your hardwood floors from damage from a fireplace. If it feels too hot or seems dangerous, it probably is. Take necessary steps to protect your floors, and you’ll stay both warm and safe this winter.